The next morning it was still pouring when I woke up. I made a mad dash to the washrooms to be followed by Tim. We decided not to even attempt riding until the rain stopped as we were to head up the Duffy Lake section of Highway 99, which would be a challenge even in good weather. 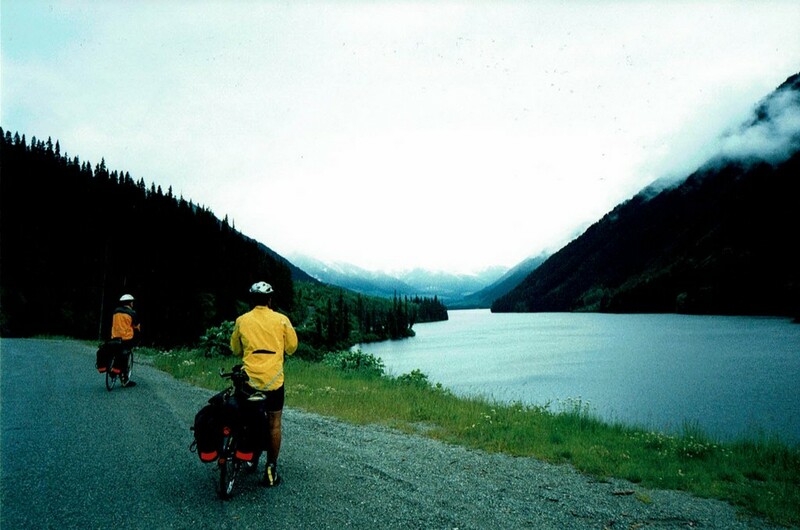 Back into the tent, I read my book for a while then fell asleep, waking up to the sounds of Larry lamenting “I’m hungry, it’s lunchtime.” The rain had just about quit, but it was almost noon and too late to ride the difficult 100 kms to Pemberton. We ventured out and had a nice lunch of fish and chips followed by a fruitless search of the local grocery stores for pita bread (it travels well in panniers! ); not an item stocked in Lillooet! We then toured the Lillooet Museum, where there was an interesting array of local historical items and literature dating back to the gold rush days, which kept us occupied for quite a while. As we left the museum the sun was actually peeking out from behind a cloud. On our way back to our camp we chatted with some locals at the railway station. 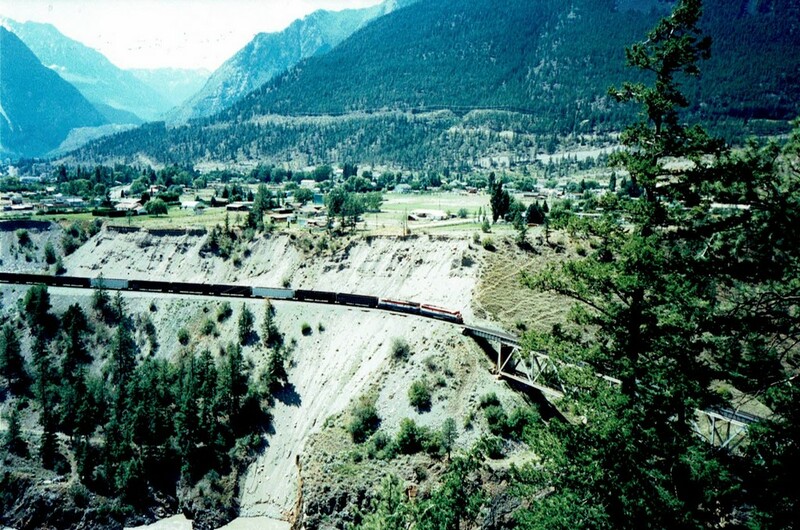 They informed us that the rainstorm had caused a massive rock slide over 400 yards of rail track, and that the train couldn’t make the run to Lillooet that day from Pemberton. Passengers were being bussed by coach to Pemberton to pick up the train there. The bus driver, who had travelled the road we were to negotiate, advised us to be careful as there were a lot of smaller rock falls on the roadway. 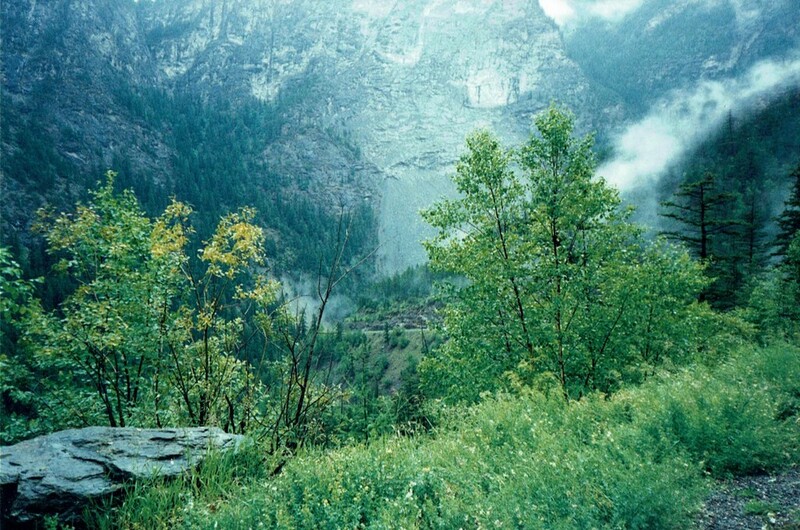 By the time we returned to our tents the raindrops had started to fall again, so we decided then that we would push on to Pemberton the next day, regardless of the weather. If it was to be rainy, we would get a motel in Pemberton and dry out. By the time we decided this and got back into our tents, it was pouring rain again! As dinnertime approached and the rain was still beating down, I found that I had enough snacks and cold food items so I didn’t have to think about cooking in the tent. However I could smell aromas from Tim’s tent! Cooking in the tents is something we are usually averse to when touring in bear country, due to the fact that the food smells tend to permeate the tent material and could be a magnet for unwelcome guests in the future. Well I did warn him! This was to be the toughest day, and in retrospect probably one of the most challenging 100 kms that I have cycled with a full touring load. The rain had tapered off in the morning, but unfortunately the tents were still wet when we packed them. We headed for town and had a hot breakfast before our journey. 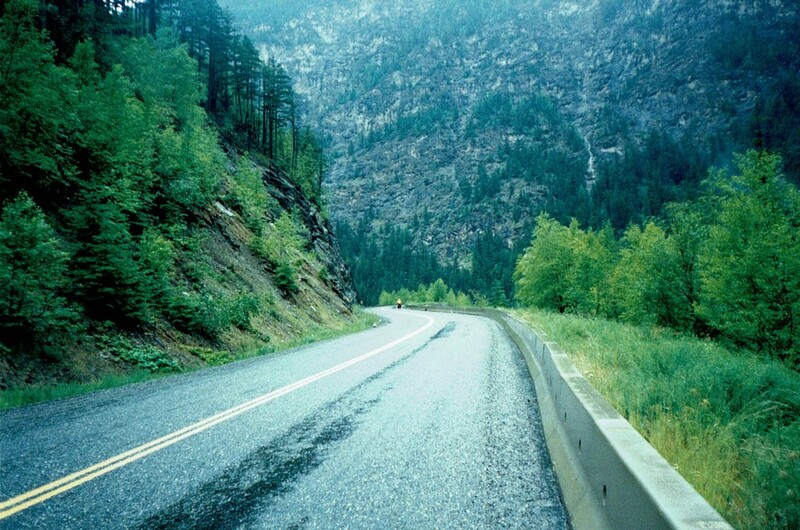 Almost immediately after leaving Lillooet, the road begins to climb and for the next 13 Kms we were subjected to grades of between 9% and 13 %, and to add insult to injury, it started raining, again! 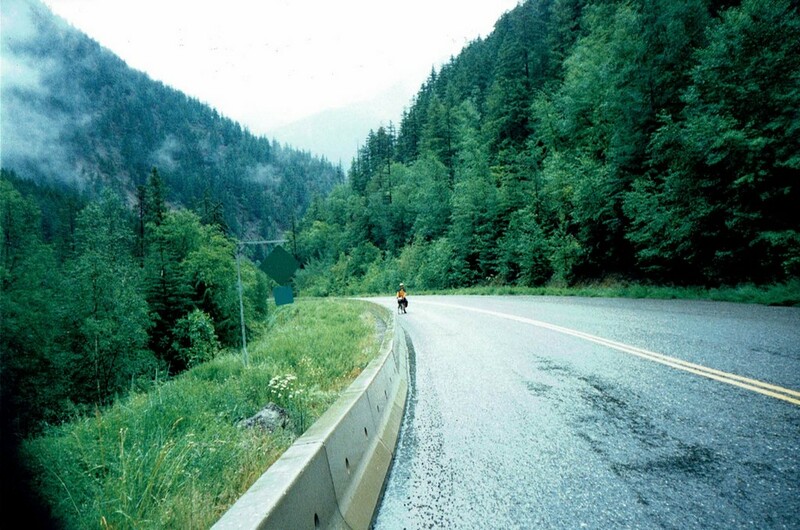 This section of Highway 99 is known as the Duffy Lake Road and is actually two mountain passes, the Cayoosh Pass at an elevation of 1160m/3805 ft and Joffre Pass at 2180m/4800 ft. With many long 13% grades it is very hilly ride, with steep, narrow and winding sections, but the scenery is absolutely stunning. There were some minor rock falls and it was very cool with some small patches of the winter’s snow still evident at the roadside. The temperature at our lunch stop of Duffy Lake was only 5°C! Where the Bear Popped up Over the Barrier! Climbing one particularly long grade, Tim was about a 100 yards ahead of me, then as he passed a section of barrier at the right hand side of the road, a bear popped up immediately after he passed and stared after him. I couldn’t believe my eyes, as I was approaching the bear and yelling out to Tim to have look, he didn’t hear me though. I laid on my air horn and scared the poor beast, who quickly retreated down the hillside at the other side of the barrier. I caught up with Tim and explained what had happened, and then I proceeded to pull his leg, telling him that the bear must have got a whiff of his nice food scented tent! Ha-ha! Larry had a puncture just after our lunch stop and we were quite cold by the time he fixed it, what’s more, we were only halfway to Pemberton! But we continued on and persevered while still gradually climbing. Thankfully the rain had almost stopped and the last stretch of grade was downhill, 15% grade with a quite a few hairpins bends; wet roads made for a dicey descent! Even with the rainspray our rims were getting hot from the constant braking and we had to stop every so often to let them cool down or risk blowing a tire. After the long downhill there was a few miles of flat road before reaching Pemberton, a full eight hours after leaving Lillooet! And that’s where the rain started in earnest again. We reached the local Travel Information Centre looking like drowned rats as we all piled into the nice warm office to learn that there was only one hotel in Pemberton, and it was getting late! We hurried off in the rain and luckily managed to snag one of the last rooms available. The desk clerk was very obliging and let us put our bikes in the hotel basement, “for security,” he said. I guess he preferred to have our dirty wet bikes there, than on the room carpet? A nice warm room, TV, soft bed and a dinner out on the town; a fitting end to an arduous day! A little more rain greeted us in the morning, but the situation didn’t seem that bad, from the hotel coffee shop that is! Fortunately, the rains would peter out after a couple of hours riding, and just as well too as we had some more climbing to accomplish to reach our lunch stop at Whistler Resort. 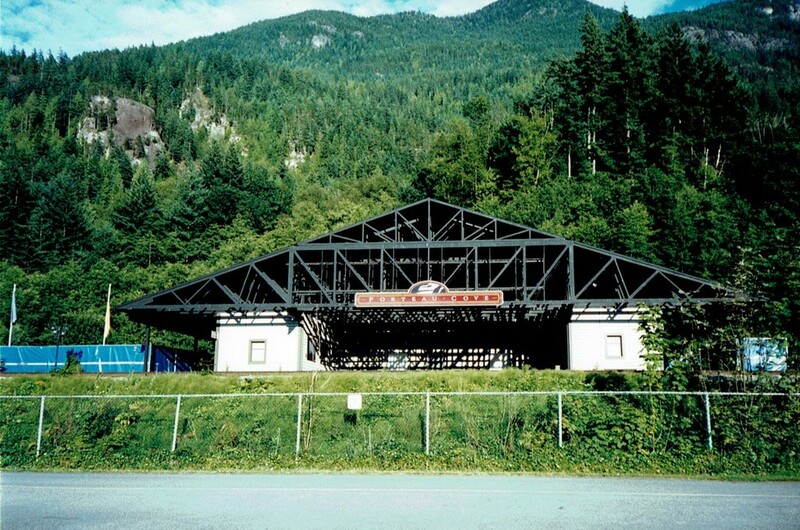 Whistler Mountain is one of the premier skiing venues in North America during the winter, and even in the summer many visitors frequent the village. I don’t know why it’s called a village though, the place is huge! Lots of Yuppie shoppers at the village and three damp smelly cyclists; we felt kind of out of place! After lunch we continued on Highway 99, this section is called the Sea to Sky Highway, be that as it may, we were going sky to sea! This section of road was not for the faint-hearted though. The traffic level was very high and I think that we encountered more logging trucks on this section than throughout our whole trip. Quite long sections of road had no shoulder at all, together with narrow, winding roadway and bridges to negotiate. Poor conditions made the downhill run less pleasant than it should have been; quite the white-knuckle event all the way to Squamish from an elevation of over 2100 ft at Whistler Village to somewhere around 20ft in Squamish. The Sea to Sky Highway 99 has been much improved since we rode it in 1999 – now there are shoulders to ride on and some of the tight curves are somewhat gentler. Nevertheless it is still a very busy road with both commercial and car traffic. While travelling through Squamish we were fortunate enough to see the Royal Hudson steam train passing through the town. Our destination of Porteau Cove Provincial park was still 17 kms south of Squamish. 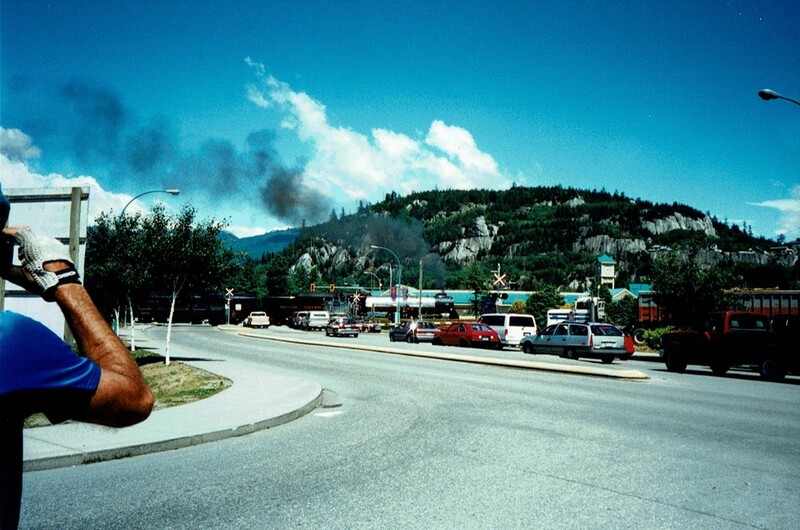 After picking up groceries in Squamish, we returned to the highway. The weather had turned quite pleasant by then and a hot sun was shining brightly. I was coasting down a hill when I spotted two young ladies sunbathing on a grassy area just over the other side of the curb barrier. They were out of sight of motorists, as the barrier was shielding them, but sitting on my bike close to the shoulder barrier I could see them quite easily, and what I saw was that they were in bikinis, laid on their fronts with their tops undone! “Now’s my chance,” I thought to myself. Finally I had spotted some babes (almost) on a beach! I quickly pointed them out to Tim and Larry, who were riding a little way back, and they took a gander as they rode by. When they caught up to me, I had great pleasure in pointing out that all my “glossy brochure type” promises were now fulfilled! I received no comment!!! We arrived at Porteau Cove Provincial Park to a full campground, even the vacant walk-in spots were reserved! The camp host told us to wait in the picnic area to see if a spot opened up. We explained that we had travelled far enough that day and didn’t relish looking for another campsite. “No problem,” he said, “there is no other campground close by!” Well at least the sun was still shining, so we dragged our wet gear out and promptly set it up in the picnic area to dry. The park ranger showed up and said that we could camp in the “overflow”part of the park, but not until after 9:00 p.m., as it was not an official camping area, merely somewhere that he could use his discretion for cyclists and the like! Hmm, we were still charged the full fee though and found that the “overflow” was at the bottom of the railway embankment! I wore ear plugs all night, which cut down on the noise, but every time a train went by it was like an earthquake under my sleeping pad! Nevertheless, we were grateful for a site as this was our final camp night of the trip. We woke up to the sun poking it’s head over the hillside and were happy that for our last day the weather would be nice. 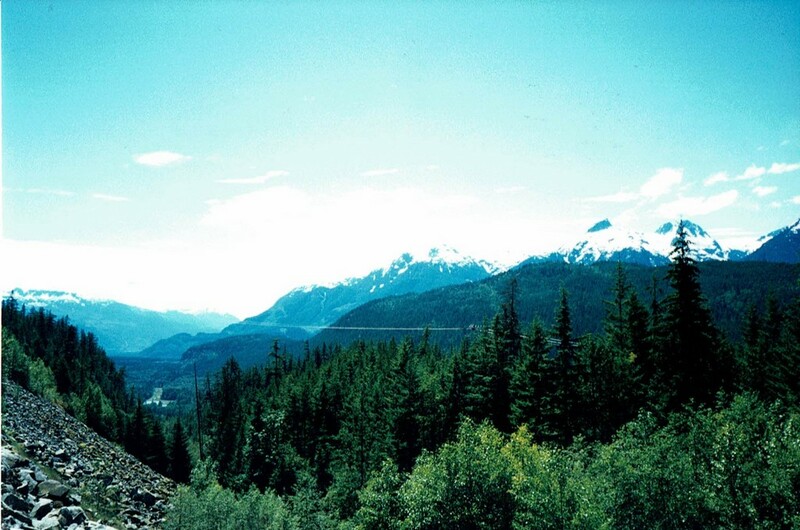 The road to Vancouver was similar to the previous day’s but more of a rolling terrain. The traffic level, once again was very high and once we reached West Vancouver it was a relief to have a wide shoulder at the side of the road. I arrived in West Vancouver a little ahead of the other guys; while I waited at the roadside, an “urban coyote” crossed the four lane highway. Apparently these coyotes have turned into real pests around Vancouver, foraging through trash and harassing pets, much like the raccoons do. But it was kind of neat to see one all the same. Tim and Larry missed that “wildlife show,” turns out that Tim had a flat just after leaving the campground! Although Vancouver is a very big city, it is very cycle friendly, with many signed bike routes avoiding highly congested areas. Traffic lights on many of the bike routes can be activated without leaving your saddle, as the large push button activators are facing the roadway. Many of the local transit buses have bike racks. Nevertheless there are places where bicycles are not allowed. Some of the bridges are tricky to cross and others are downright dangerous. From Horseshoe Bay in West Vancouver, Highway 99 is combined with Highway 1, the Trans Canada, and is known locally as the Upper Levels Highway. We took this route and turned off to Marine Drive at Taylor Way. Almost immediately we were at our first bridge crossing, the Lions Gate Bridge. This one was pretty hairy, it is high and long; bicycles must share the sidewalk with pedestrians. Luckily, usually there are not many pedestrians, but the sidewalk is quite high above the roadway and very narrow, especially for a bike with large panniers. At the time of writing the Lions Gate Bridge was due for major renovations, which have now been completed. The bridge is now almost a pleasure to ride across and is definitely bicycle friendly using a segregated, wide pathway shared with pedestrians – the southern approach is still mostly on a shared sidewalk unless one rides through Stanley Park to connect to the bridge via one of the access roads from Stanley Park Drive. We made it across with no problem only to witness a cyclist being hit by a car going the other way. I used my cell phone to call an ambulance and fortunately the lady cyclist was not seriously injured. Gingerly, we continued on through Stanley Park and south on Burrard to the Burrard Bridge. Once again we shared the sidewalk, but this one is very wide and marked with separate lanes for pedestrians and cyclists. The Burrard Bridge now has segregated bike lanes in order to avoid conflict with pedestrians and motor vehicles. After the bridge we turned right and picked up the Cypress bike route all the way to 70th Avenue, then turned left to Oak Street and onto the Oak Street Bridge. Cyclists must use the sidewalk (with barrier) on this bridge. Oak Street turns into Highway 99, but cyclists are not allowed on this section of 99 south to the US/Canada border. On exiting the bridge we turned right and then left (south) onto Garden City Road which took us through Richmond to Williams Road, left to #5 Road, then south to Rice Mill Road, then east over a Highway 99 via the overpass to the Tourist Information Booth, where a shuttle service is operated by the Ministry of Highways to take cyclists through the George Massey Tunnel part of Highway 99. The shuttle dropped us off at the junction of Highway 17 and off we rode towards the Tsawwassen Ferry Causeway in order to catch the ferry back to Swartz Bay and ultimately Sidney-by-the-Sea, home sweet home! Just a short ride for me after the 1 1/2 hour ferry trip, and about 30 kms for Tim and Larry until they’d get home, 2200 kms later! Hindsight is always 20/20; the weather was fickle on this trip and we probably should have left a couple of weeks later than we did. Perhaps we would have missed some of the wet weather, but with the adverse weather conditions that had plagued BC in the Spring of 1999, made it was difficult to predict a forecast accurately . Notwithstanding, the trip was excellent and we all had a first-rate, memorable tour!